Generic name for pod-bearing leguminous trees and shrubs, generally with showy flowers. PROTO CENTRAL EASTERN POLYNESIAN *kōfai. 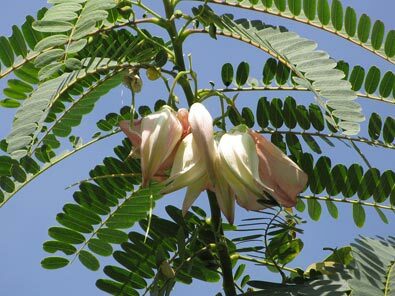 The name *kōfai probably originally designated the Tahitian variety of Sesbania grandiflora (a.k.a. S. coccinea), once found in coastal areas generally, but now extinct on Tahiti, Moorea and Raiatea, and replaced by exotic varieties and species of that genus. Reflexes of the oiginal name have similarly been applied in various parts of Eastern Polynesia, from Hawaii to Aotearoa, to a few other species of leguminous trees, both native and exotic, with showy flowers and large pods. Sesbania grandiflora (some varieties of which are native to various islands in Society group, but which have been replaced by an exotic subspecies in many of them) is a small tree which grows 3 to 5 metres high, with red or white flowers and bean-like pods up to 45 cm long. 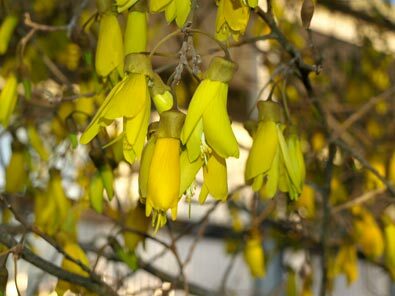 The kōwhai-like flowers and young pods are eaten in some places. It is grown extensively in Hawaii, but has not become naturalized. The exotic variety was introduced to Tahiti in 1845, and seems to have displaced the local subspecies. A native variety, S. grandiflora tuamotensis, with delicate red flowers, survives on some islands of the Tuamotu archipelago. Sesbania tomentosa is endemic to Hawai'i, where it will be the original 'ōhai. Its flowers vary from red to orange, and in some environments it is a tree, while in others it is a prostrate shrub. The degree of hairiness of its leaflets also varies. It is endangered because of destruction of habitat and the introduction of competing species. It is thought that the separation of plants of this species into locally distinct populations is because of habitat destruction accompanying "development" (Wagner et al., p. 705). 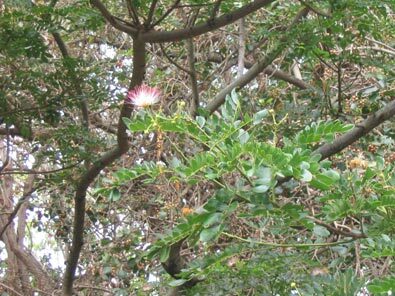 The other Hawaiian 'ōhia, the "monkeypod" or "rain tree", Samanea saman, is also a member of the Fabaceae. It is native to the tropical Americas and was introduced to Hawaii some time before 1875 (Wagner et al., p. 696). 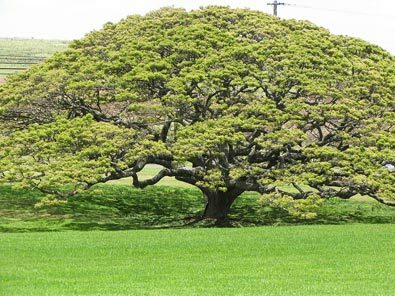 It is a large, spreading tree which can grow to 25 m high with a diameter of up to 40 m. In Hawaii it is used extensively for planting along major roads, despite its propensity to shed branches in bad weather. 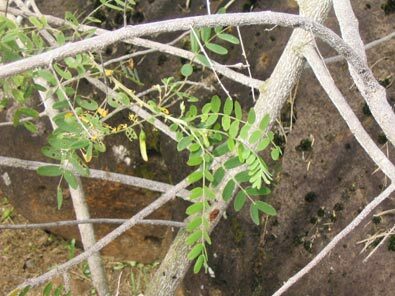 Like a mimosa, it folds its leaves in rain and at night. This makes it useful as a nurse tree for crops like cacao, as rain easily reaches the plants it is shetering. It has pink or creamy-coloured flowers with slim, bean-like pods. The wood makes excellent timber, and the bark and seeds have medicinal properties. Caesalpinia pulcherrima, another native of the tropical Americas which has been given names derived from *kōfai in several parts of Polynesia. Along with a number of other species, for example the flame tree, Delonix regia, it was once included in the genus Poinciana (named for Louis de Poinci, a 17th century governor of the French Antilles, who had an interest in botany), and this name has persisted as a common name for these trees. It is called 'ōhai ali'i in Hawaii, and kohai in the Marquesas. It grows as a shrub up to 3 metres tall, and bears flowers in racemes up to 20 cm long. Each flower has five yellow, orange or red petals. The pod is up to 12 cm long. The mature seeds are poisonous. The shrub is grown mainly as an ornamental plant. Another poinciana, Delonix regia (mentioned above) is known as 'ohai 'ula in Hawaii. There are notes on this name and the tree in the page for kōwhai. Further information : See Wagner et al., Manual of the Flowering Plants of Hawai'i, and other works on plants of the Pacific listed in the Bibliography; also the page on kōwhai. 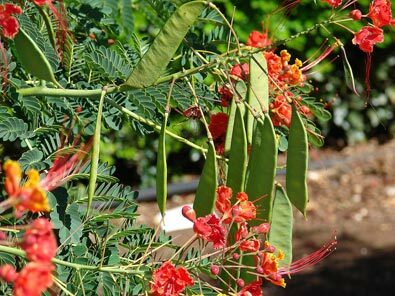 Photographs: We are grateful to Forest and Kim Starr, Starr Environmental, for photographs of Caesalipinia pulcerrima, Sesbania grandiflora, and Samanea saman. The others were taken by R.B. (Te Māra Reo) in Hawai'i and Aotearoa.